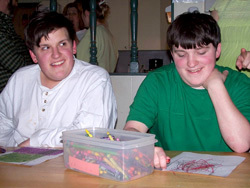 The Groden Center Residential Program enhances the lives of children and youth with developmental disabilities, autism, behavioral disorders, and others at risk, and their families through provision of an intensive learning environment where they can achieve a balance across all life skills that leads to greater independence and inclusion. The center is dedicated to understanding the developmental needs of its children and youth, investigating the most effective educational and treatment strategies, and contributing this information to related fields. The residential program is open 365 days per year with holiday and vacation periods that correspond with the day program. Due to a variety of circumstances, youth may need placements outside of their own home. For these individuals, a supportive residential program can foster the development of behavioral control, social skills, and adaptive living skills, giving them the opportunity to become as independent as possible. The Center operates several group homes for youth who are in need of alternative living arrangements. Each living arrangement serves between three and six individuals. They are located in both rural and suburban settings in close proximity to a variety of community services. Family members are encouraged to be an integral part of their son's/daughter's life. They are welcome to visit the homes, participate in home functions and take their child out for meals, special outings, overnights, holidays, and vacation periods. Local school departments, state agencies and other responsible providers can make referrals directly to the program by contacting the Admissions Office at the Center. Families, advocates, and funding agencies are welcome to visit the Center to tour the program. When the Center receives all of the individual's current records, the funding agent, family and child/youth will visit the Center for an interview and screening to determine program needs. Following this review process, the Center will determine how and when it can best serve the individual, notifying the funding agent and family. For all the details, as well as a brochure, for this new GRODEN NETWORK program, please click on this link.